Nebraska City Mysteries | Does Nebraska City have an ICBM Silo? Does Nebraska City have an ICBM Silo? The Atlas-F ICBM (operational 1961-65) was an important component of national defense during the Cold War. Twelve Atlas sites, one located half a mile west, were manned by the 551st Strategic Missile Squadron, Lincoln Air Force Base. On November 22, 1964, a crew from this site died in a plane crash a mile south of here. The victims were Maj. Lee Craft, 1st Lt. Chester Higgenbotham, S/Sgt. Harold Hrenchir, A/1C Donald Moore, A/2C David Theriot, and pilot Maj. Robert Wilson. The Marker is located on North 56th Road just north of Highway 2. 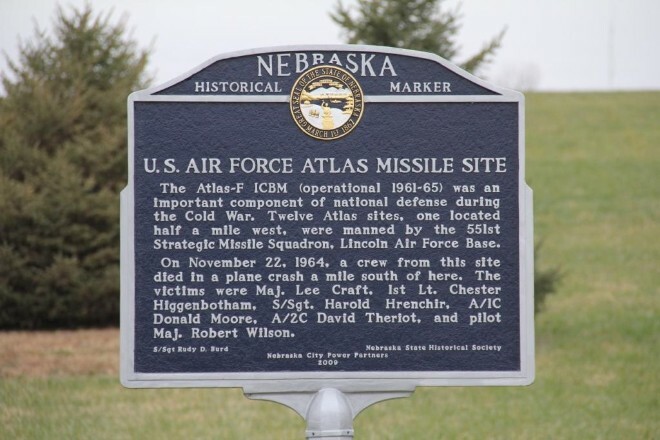 I was wondering where this historical marker commemorating the 11/22/64 ICBM plane crash is. Also was Arbor Dr., north of Arbor Lodge, once an airplane runway? See Revised entry for map and location of the marker!